Thanks Shawn. I’ve never been comportable with the data/info/knowledge[/Wisdom] pyramid or scale. The view you’ve provided is going to be much more useful. Your addition of the sense making arrow is interesting. Can you elaborate? The dissonance of the strucutres of infromation with data would incrase sense making capability …. Thanks for the comments Andrew and Dave. In my mind information is flying past us all the time. Now and then we will notice and name an aspect of it and if it creates either surprise or an unsettling feeling, and we care about resolving the dissonance, we will try and work it out. This process is sensemaking and it also creates knowledge. The transformation between data and information is possible due to the application of knowledge. There might be sensemaking occuring at this point as well but my gut tells me it relies more on a deductive approach. Peter Drucker coined the term knowledge worker, but was wise enough to know that all models are wrong, in that spirit can I ramble a little? Data and information flow down increasingly fatter pipes, coming at us so fast we drown in a sea of information (or spam :). But Maturana offers glimpses that the pipe/transmission metaphor for human communication is, like the old idea of a little man operating our brain, just flat wrong; and Feldman finds that comparing the brain to a CPU is deeply flawed; and Hawkins describes the neural circuitry folding back so that the brain is not only seeking out patterns but actively predicting what it expects to sense (see/hear/feel) next, recalling sequences triggered by cues in activated frames, so the hand knows how to point the finger without our conscious self having to tell it, and we pay attention to unexpected surprises. Maybe instead of nouns (data, information, knowledge) we could think of more active words, so that knowledge does not become an end (to be tested in an exam, or managed with expensive software), but a means, a way to make sense of our world (tested every living second), to not only find and tame the ox for ourself but to act wisely for others in the market. Instead of a matrix diagram or the linear chain classically rational progression, perhaps the model is more of a network, a pattern language, built around concepts like collecting and connecting, pattern seeking, predicting, recognising, matching and mismatching, or variations on the acting,sensing,probing loops. One which uses not just a single loop but a double loop to accomodate the desire for adaptive and constructive learning (better models, the investment in the loop appreciaties) but also allows for irrational beliefs (cognitive distortions). We may choose listening to stories, exploring a complex space and reading anecdote(s).au, leaving the management of data, information and knowledge to those who’ve not moved to Mr. Pink’s conceptual age. Ken, your comment is inspiring and with each line I was nodding in agreement. It’s seems you are so close to another conception of these relationships and I encourage you to get it down and share it with us. Yes, let’s move away from nouns and show the loops, but let’s be careful not to fool ourselves into thinking we know how this works? I would bemoan a systems-like diagram which gives people the impression that we know all the cause and effect relationships. I’d be happier if we had a way to show more uncertainty. I wonder what that would look like? I came here from the creating passionate users page. And I agree more with your diagram. There is no hierarchy onlu constant flow in my opinion of data back to or onwards to wisdom. 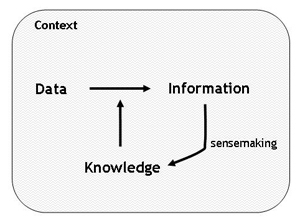 I myself have tried to create a more 3D diagram where data > information > knowledge > wisdom grow out along three axis. Maybe I will publish it on my blog someday. I also remember a quote from Dave Snowden saying that defining knowledge management is rather useless at best and academic at worst — it was more important to realise knowledge management is about helping people share information. Information alone is not knowledge, aka you cannot take people (reasoning and context) out of the equation.